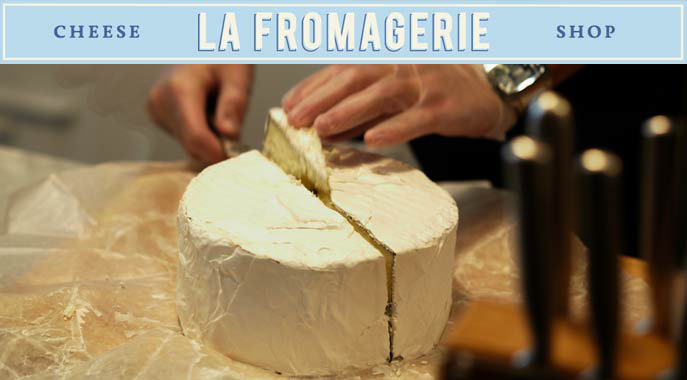 La Fromagerie cheese shop: Support us with edible credits. We encourage sampling so people can find the perfect cheese for them. We created La Fromagerie to share our passion for cheese with San Francisco's Dogpatch community. We promote sampling because we feel it is the best way to educate and communicate. Our clients should be able to select the appropriate cheese that will pair nicely with their wine and food. Using our French roots, we offer natural and tasty gourmet products which we grew up with. We stock over 50 types of authentic cheese, mostly from France but also from Spain, Italy, and the US. We promote the products of great local businesses like the unique brick oven bread from Firebrand and the delicious charcuterie from Fabrique Delices. We create our own recipes and handcraft our gourmet sandwiches. We use our European background to revisit a "Parisien" baguette, to do a "veggie" with a Mediterranean influence, or to mix smoked duck breast, figs and sheep cheese from the South West of France for an exceptional sandwich treat. We only use prime ingredients in our sandwiches: brick oven ciabatta rolls, mozzarella di bufala from Italy, prosciuttos that are family farm raised and antibiotic free. With your prepayment, we can pay the vendors for more inventory of our prime products! You get "edible credits" in a house account you can use anytime you walk in. Merci! Complimentary invitation to our quarterly cheese class.